Marshlands, by Matthew Olshan: This novel of war and conquered territories deals in very few details, but that only made it all the more powerful. Read my full review of Marshlands. 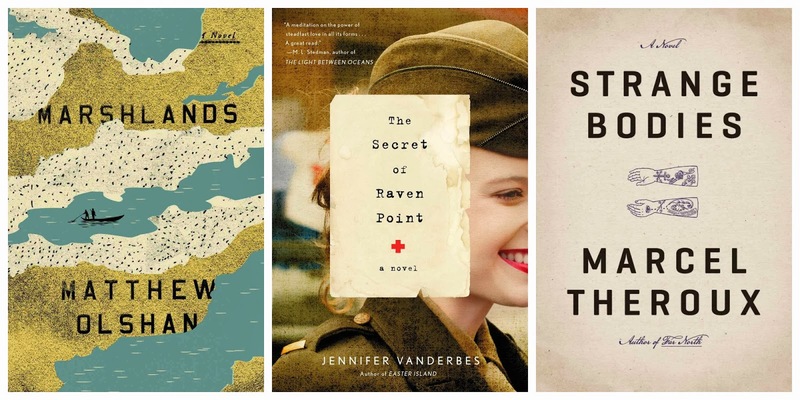 The Secret of Raven Point, by Jennifer Vanderbes: This novel of World War II had a few issues, but ultimately, Vanderbes won me over with her ability to depict the raw emotion and lingering uncertainties of wartime, this time tackling the Italian front of World War II through the eyes of a young nurse looking for her missing brother. Read my full review of The Secret of Raven Point. Strange Bodies, by Marcel Theroux: I devoured this book, staying up way past my bedtime on already-busy days to finish it. It asks big questions, about the soul vs. the body, our memories vs. others perceptions of us, and how we define our selves, but embeds them all in a thrilling mystery. Definitely recommended. Full review to come. Kinder Than Solitude, by Yiyun Li: Yiyun Li's novel of three teenagers and the murder they may have committed is quiet and slow to build. I haven't quite finished it, but already can't find the words to express how strange the story is, and yet how easy it is to get lost in. Stay tuned for a full review. 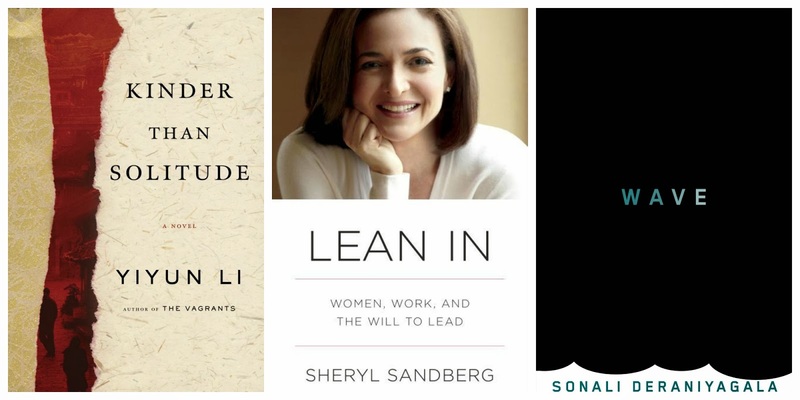 Lean In, by Sheryl Sandberg: I put off reading Lean In for far too long, it seems, as all of my reservations about the preachy, self-help nature of Sandberg's writing were entirely off-base. I found a lot here to apply to my own life, and am certain my copy will be revisited time and again. Read my full thoughts--not truly a review, though--on Lean In. Wave, by Sonali Derinayagala: Wave was on my list of 2013 titles I was sorry to have missed when they first came out, and I finally took the time to go back and revisit it this month. The story was much less about the wave itself than I had anticipated, but Derinayagala's account of the grief she carried with her--and still carries today--after the sudden loss of her parents, husband, and two young boys is impossible to ignore. Read my thoughts of Wave. That's an extremely impressive list--not only did you read that many books, you managed to review them all, too! Thanks! I didn't quite review *all* of them, but I'm trying to be better about keeping up with reviews. I'm always so jealous of everyone who reads all these delicious new releases. I can never keep up because I have such a backlog of backlist titles that I already own. Will just keep adding to the TBR list!! The downside of keeping up with the new books is that my stack of backlist titles is very dusty and abandoned-looking these days... one year I did a "summer of TBR," which I might try again this year. I have SO many books already! I don't need to keep adding new ones. Happy to hear that Kinder than Solitude is good! I saw it in the publishers' catalog earlier this year and thought it looked really interesting.